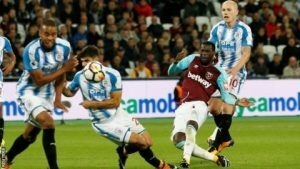 West Ham have only played Huddersfield 41 times despite first playing 99 years ago in December 1919. The Hammers have lost 22 games, drawn 7 and won just 12 games against the Terriers. In recent times the Irons loss came in September 1997 in the League Cup when Huddersfield came away the 1-0 winners at the McAlpine Stadium, a game that had Ludek Miklosko in goal and John Hartson and Paul Kitson up front. West Ham won the return leg later that month 3-0 at the Boleyn Ground in front of a crowd of 16,137 thanks to a John Hartson hat trick. Since the Terriers promotion to the Premier League West Ham have won both games. In September 2017 the Irons came out 2-0 victors at the London Stadium thanks to Pedro Obiang and Andrew Ayew. Possibly more memorable was the 4-1 away win in January this year at the John’s Smith Stadium with goals with Mark Noble, Marko Arnautovic and a brace from Manuel Lanzini. That win put the Hammers up to 11th with eight points from their last four away games under David Moyes. ← Poll: Should Andy Carroll get a two year extension?